The lease agreement, which details a 66-year partnership between Dana Point Harbor for the $330 million redevelopment of land and water, was signed on Nov. 2. 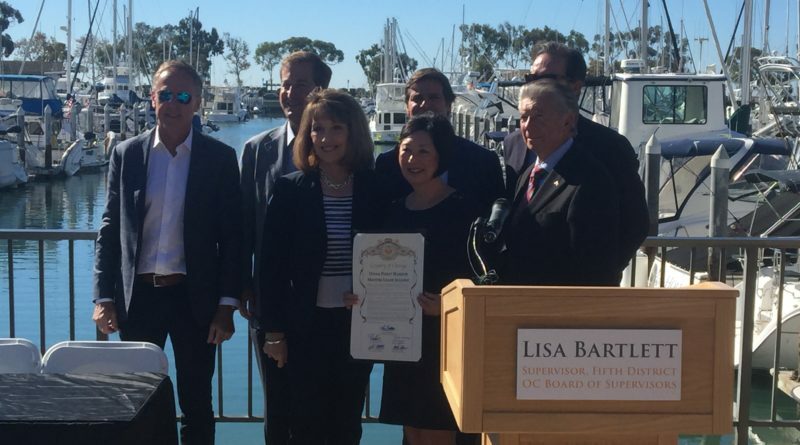 DANA POINT — If omens are to go by, then the unusually hot autumn day in Dana Point beaconed a bright future for the master ground lease signed between 5th District Supervisor Lisa Bartlett (on behalf of Orange County) and the developers known as Dana Point Harbor Partners (DPHP) on Nov. 2. The agreement, using a term likely to be permanently imprinted into the minds of those close to the matter, has been more than 20 years in the making and will last for the next 66 years. In truth, there is a little to be nervous about as the lease guides the $330 million project: Though a landmark moment for Dana Point residents, business owners and local politicians, this lease agreement is just the beginning of a long process to construct a unique harbor and landside project. The county of Orange, up until recently, has been quiet about the project, but has offered documentation the public can access on Dana Point Harbor Advisory Board’s official website. DPHP, for those who have not been glued to the proceedings, is made up of four people: Bryon Ward and Scott Burnham of Newport-Beach-based real estate development company Burnham Ward Properties; Joe Ueberroth of Belwether Financial and Bellingham Marine (fun fact: Ueberroth is also one-time baseball commissioner and businessman Peter Ueberroth’s son); and R. D. Olson, who has most recently constructed luxury hotels such as Lido House in Newport and Pasea in Huntington Beach. To be clear, all of the partners are local to Orange County and have good reputations in the community. Each developer, during the lease-signing ceremony, did appeal to the ethos of Dana Point locals and offered up their own stories of visiting the harbor during childhood or with their families. According to DPHP, this harbor is a being designed to stand the tests of time for 100 years or more. Of course, the first steps are decidedly working with the commercial core and erecting the parking structure. Parking has been notoriously crammed in Dana Point Harbor, but one of the first major focuses will be solving that problem. Ward has stated in the past that the parking issue will be solved and that Burnham Ward Properties will work on it in phases so as to create the least amount of disruption possible. Dana Point’s 12 Guiding Principles, an important goal statement that has lead the revitalization, was also mentioned again. Burnham picked up on a phrase Bartlett used several times, stating while she has called the partnership “best in class,” he feels this lease is “best in discipline” by bringing together a highly specialized group of developers to complete the revitalization. Burnham also described the “completely re-imagined commercial core” as “water-centric” and “California beach at its best,” indicating the new design style will likely be married with the old style in a contemporary coastal style. In recent Standing Watching column, penned by The Log’s Parimal M. Rohit, he had discussed the lack of green space in many modern redevelopments along the coast. Burnham was sure to touch on Dana Point’s “pedestrian friendly” environment and promised a 125,000-square-foot open space with a focus on added “enhanced programming events” like the festivals that have become so popular. For boaters, Ueberroth addressed the marina side, saying he expected to incorporate green designs and would work towards making Dana Point a destination harbor. “We are rolling up our sleeves quickly. The project will be completed in phases, but we are not going to stop,” said Ueberroth, making a nod towards the estimated 10 years or so mapped to complete the commercial, marina and hotel cores altogether. Ueberroth, who has worked with the local community to gather feedback, stated: “This isn’t our design – this is OUR design,” with an emphasis on the project being collaborative in nature. Founder of R. D. Olson and head of the hotel design, Bob Olson, gave a nod to Ward as “the brainchild” of the financially integrated partnership and also stated: “Lisa Bartlett drives a hard bargain.” One of the rumored reasons that the draft lease supposedly took so long, according to an unnamed source, was due to the County’s butting heads over costs between the developers. Visitors can expect to see the development of an affordable hotel, keeping in line with the Local Coastal Plan (LCP), and one newly constructed high-end hotel by R.D. Olson. At this point, few renderings have been released, but now that the lease is signs predictions are that design elements and plans will begin to surface. Bartlett spent much of the past year, leading up to the lease signing, in the line of fire, but she has also been credited with her tactics leading to the master ground lease being signed. As a resident of Dana Point for more 30 years and with her rise up the political ranks in Orange County starting there, the revitalization project has been a major agenda item for Bartlett. During her introductory speech, Bartlett stated the extra year had been spent “to do it [the contract] right.” The contract is referred to as “P3,” meaning a public-private partnership. The cooperative agreement between the county and the private sector will see the for-profit sector (DPHP) in a long-term lease for 66 years. Bartlett wants the general public to know this project will be “no public debt” and that the financial risk, because the public sector will be taking on the costs of the revitalization, will be low. She also mentioned that because of this contract and though it seems like there will still be many years ahead to complete the revitalization, it would come together “quicker and better” as a P3 (as opposed to the county being solely responsible for the project). There was still the matter of a project management group, PDI, who spent millions in funds leading up to the lease signing. Bartlett stated permits collected and work conducted by PDI was still valid and would be used when the groundbreaking stage begins. When asked if there was a timeline for when construction would begin, Bartlett stated county officials would send out an announcement. For local business owners and residents who have grown up in Dana Point, this was clearly an emotional day. James Lenthall, chair of Dana Point Harbor Advisory Board and president of Dana Point Boaters Association, was invited to speak before the contract was signed. “Over all this time, this harbor has earned its own personality, its own soul. Dana Point Harbor has a charm and character all its own — we know it, we feel it, we cherish is – and we protect it. And today we stand at a crossroads, setting a new course for our harbor for the next 66 years. The events being marked today have made some of us very nervous. Nervous that we might be endangering what we’ve come to love in this place. Count me among them. Lenthall also touched on PDI project management and that the permits were still good, and while revitalization may take the larger half of six to seven years, it may be for the better good of the community. Donna Kalez, general manager of Dana Wharf Sportsfishing and member of DPHAB, spoke with The Log about the process of selecting tenants for the commercial core. Some tenants are currently on a month-to-month lease, while others will renew their leases in 2020. Kalez, however, was optimistic and stated, “We trust the process,” and noted that finally many residents, whether business owners or not, could envision a newly revitalized harbor in the future. According to speakers at the signing, there may be noticeable work completed at Dana Point Harbor by the end of 2019. To echo Lenthall’s words, The Log has also spent many years covering the stalls, the growing pains and now the joy and nervous anticipation that a finalized lease has decided the harbor’s fate. As surely as the community will continue to be a part of the evolution, The Log will continue to write on the developments as they occur. The general public can view a timeline and other information at dphadvisory.org and can expect a newly revamped harbor by 2030.